Damascus was founded in the 3rd millennium B.C. and is today one of the oldest cities in the Middle East. The city today is an amazing mixture of old and new. Based on a Roman plan, it is a key example of urban planning. Many travelers have considered the city an earthly paradise, given the abundance of water. In fact, when Prophet Mohammed first looked at the city, he refused to enter it since he believed people could only enter paradise once and he would have to forsake the earthly paradise if he had entered it then. It has about 125 monuments from different times in history and one of the most spectacular ones is the Great Umayyad Mosque from the 8th century. The mosque is built on an Assyrian sanctuary and is a masterpiece of Umayyad architecture. Apart from the Great Umayyad Mosque, which has been an Aramaic temple, a Roman temple as well as a Byzantine cathedral, there are many more attractions to be seen in the city. The National Museum has many treasures from the country’s archaeological sites and the Old City is a place where tourists can stroll through the labyrinthine alleys and admire fine palaces and mosques. It’s spectacular to see how the Old City has preserved its historical aspects till today. The high wall protecting it is clearly visible until today. UNESCO recognized the city as a World Heritage Site in 1979. The city was the center of a craft industry in the middle ages. It specialized in swords and lace. Damascus had not been documented as an important city until the Aramaeans arrived. The Umayyad has floors that are blanketed with valuable oriental rugs and the mosque is well known for its prayer hall. 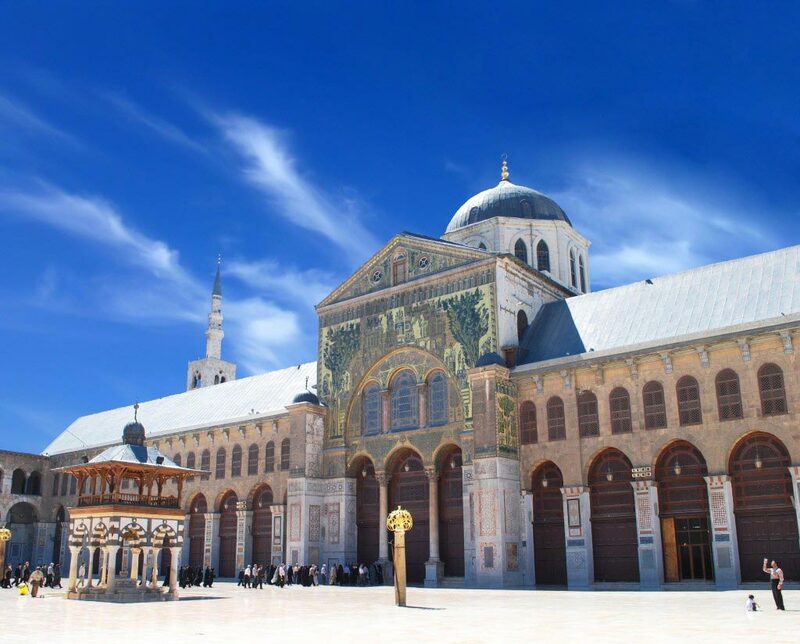 The tomb of Salah al-Din Yusuf Ibn Ayyub, the legendary warrior who defeated the Crusaders is situated next to the Umayyad mosque. Many residents have left the ancient section of Damascus in search of more modern housing. This trend has not only resulted in the decrease of population but it may also threaten some of the historic legacy of the city. Where is Damascus Old City? 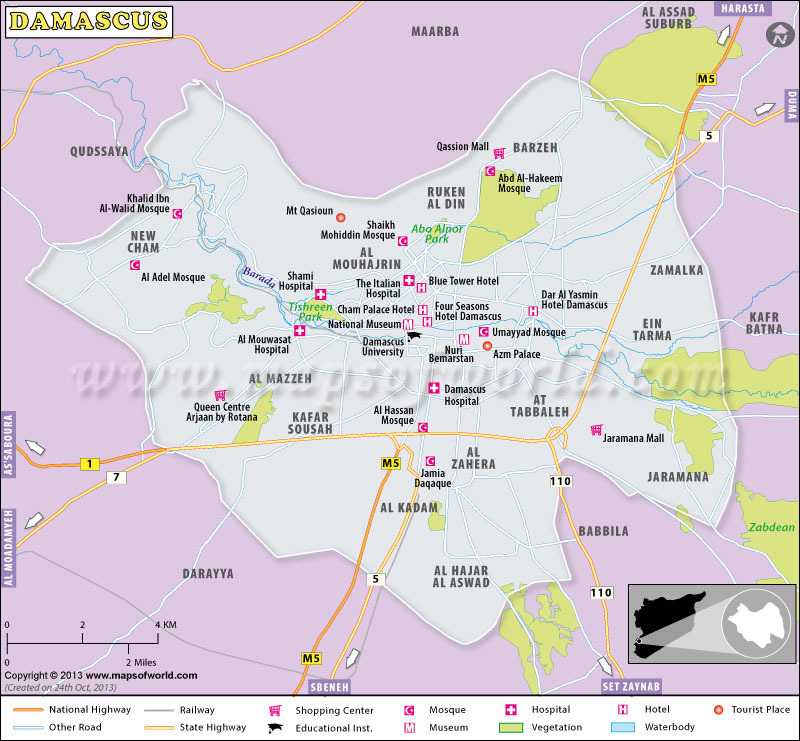 Damascus is the capital city of Syria and is located in the southwestern corner of the country. It has been rightly referred to as being the “pearl of the East”. Damascus can be visited at any time of the year. It should be noted that summer in the region is hot and winter is wet and mild. Spring and fall months are excellent seasons to visit the city.